Cloud9 normally manages IAM credentials dynamically. This isn’t currently compatible with the aws-iam-authenticator plugin, so we will disable it and rely on the IAM role instead. Use the GetCallerIdentity CLI command to validate that the Cloud9 IDE is using the correct IAM role. 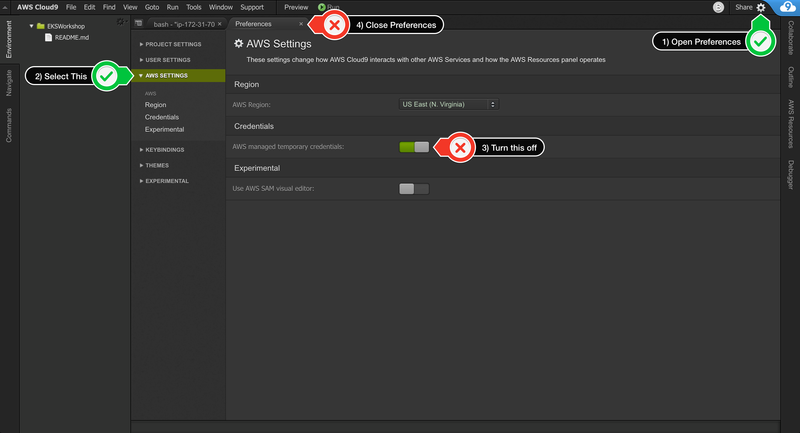 If the Arn contains the role name from above and an Instance ID, you may proceed. If the _Arn contains anything other than TeamRole, MasterRole, or does not match the role name output above, DO NOT PROCEED. Go back and confirm the steps on this page.